Moving soon? You need the right materials to make the big Moving-Day less stressful and however, successful. When compiling your moving supply list for your office or household one item you will need is moving blankets to cover your furniture and other heavier odd shaped furniture. These blankets can be used later to soundproof rooms, renovation projects, or closing the house for summer to protect your household goods. To move the most valuable possessions, you really need to purchase a set of 12 supreme professional quality soundproof moving blankets to protect them against any dings which may occur during transit and then use them as soundproofing blankets. Moving Blankets are made with a Woven fabric. It can be polyester, cotton-polyester blend, cotton or any other material that has high abrasive resistant and can withstand wear and tear to a high degree. Moving blankets are perhaps, preferred to be thick, because they are designed to protect furniture from possible dents and scratch while moving them from your house, office, to a new location. Rubbing in the moving truck during transit could cause serious damage to your valuables. However, the need for soundproof moving blankets come in handy to keep the noise from traveling while you are playing loud music or soundproofing your stage. These performance moving blankets are high-quality, quilted blankets that come complete with durable zigzag stitching. You can use them across all types of furniture and surfaces ranging from fabric headboards to shiny, polished tabletops. These moving blankets are soft and strong, making them durable for wrapping up all kinds of furniture. They will not scratch the surfaces of your most delicate and fragile furniture. More so, they will protect your valuable items from the inevitable moving problems such as deep scratches and dings. As the time of moving draws closer many things run through your head, but You have no worries knowing that your furniture is wrapped in supreme professional quality moving blankets, it will protect your items on hitting the roadways or when you’re conveying them downstairs, into a moving truck to your new home or office. Repurpose moving blankets to the soundproofing studio or for high noise areas. Your new neighbors will thank-you! You need the right moving supplies to help ensure your valuables are protected during your move. Don't waste your hard-earned money on cheap moving blankets. Instead, purchase these high-performance-durable moving blankets, and have a ready supply of quality soft but thick blankets that will protect your investment and can be reused move after move. 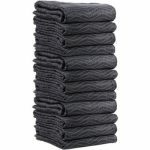 When you purchase these supreme professional quality moving blankets you will get twelve blankets or more in your pack. When it comes to providing superior protection for your furniture and other valuables, moving blankets are the people’s choice. They come in a variety of style from economy blankets to deluxe high-quality soundproof blankets depending on your needs and budget. No matter which moving blanket you choose, they all protect your items from scratches, clouds of dust, and dirt when moving. Purchase your soundproof moving blankets today. There are many other tasks that make these blankets a must for any household! These sturdy, heavy-duty, soft but thick blankets cushion and protect your furniture without you needing to purchase extra materials such as tape or cords to keep them positioned on the furniture. Load your furniture into the moving truck with these moving blankets and nestle the furniture side by side. Uboxes, a product of quality!